Day 186: Partners In Everything . . .
Tonight we were tracing crosses from a template and cutting them out; sanding the wood to a smooth finish in preparation for a coat of paint. It’s actually a ‘business’ started by Daughter #2 as a way to make some money on the side (not a small amount when you take out the “donated” items from Parents, Inc.) while at the same time, help develop her creative abilities. While tracing from our template, that we’ve had for probably four or five years, it was obvious that this one was worn out. The ends of the paper were frayed; the paper itself curled and the corners had been run into by a pencil so many times that instead of coming to a point, the corners came to a circle! Stepping outside so Jean could have a few more to cut and prep, Brian came back into the house to toss together a late dinner. We were both doing what we were doing and before dinner was ready, Brian was going to take the dogs out for a ‘break’. Before he could step forward to get their leashes, he notices three mechanical pencils on the floor . . . they had been previously placed on the table. A quick look to the other side of the table, and all at once – the air came out of the balloon . . .there on the floor was the five year old cross template. Eaten. Chewed. Left like a paper wad on a blackboard. Curiously, two of the THREE dogs were still hanging around; however, one of the them was NO WHERE to be found! A little loud talking at this point puts all three dogs on notice that we “AREN’T HAPPY”! While Andie, the middle dog squints her eyes, as if to say, “I’m so sorry, I didn’t mean it; I didn’t do anything, but I’m SO sorry”; Pepper, the elder stateswoman of the crew looks around like, “Really? You DON’T think for a moment that I, the Queen, had ANYTHING to do with this?” In both instances, the tails were wagging at a ‘normal’ pace. However, no where to be found was the youngest . . . Jasmine. A quick search of the down stairs bedrooms, and there she was . . . sunk in the bed for as low as possible – her ears had disappeared from her head as if to illustrate “if they don’t see me, they won’t yell at me!” As usual, when trouble abounds, dogs band together and NEVER talk. They never give up each other; they never ‘rat out’ one or the other and they ALL stare at you with ‘innocent’ brown eyes . . . HA! Do they think we were born yesterday? YES!!! 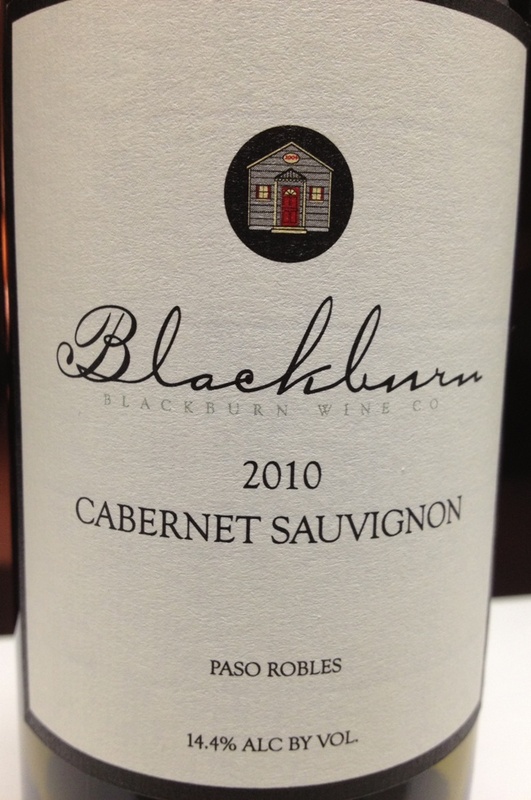 Tonight we opened a 2010 Blackburn Cabernet Sauvignon from – you guessed it . . . Paso Robles. No, we didn’t visit this boutique winery; however, after trying their Cab tonight, we are intrigued to learn more about this winery. What they say about this wine, “A very nice affordable Paso Robles Cabernet Sauvignon from winemaker Kevin Riley It is a dry full-bodied fruit-foward driven wine. Everything you love about Paso is in this bottle! 84% Cabernet Sauvignon, 14% Petite Sirah, 2% Mourvedre This rich, intensely flavored Cab is filled with fruit & spice. The nose, dominated with flavors of ripe cherry, stewed berries and cinnamon, carries on through the palate. Layers of toffee, savory herbs, and currant unfold and lead you to a long, persistent finish with lush, juicy tannins.” What we say, the nose is like opening a jar of blackberry jam; so fruity that we had to stop for a moment and collect our noses!! The taste is very fruit forward with very little oak . . . it’s fruit-and more-fruit! The finish was the best part – long-lasting and delicious; however, it had just enough of a ‘bite’ on the finish to cause us to question the quality. At the end of the day, for a $15 bottle of wine, it has ‘MOXIE’ . . . and we like wines with moxie. Blackburn reminds us of our three ‘loyal’ followers – our dogs that never question where we’ve been; are never mad that we’re late; are happy to have food in their bowls and always have time to wag their tails!!! This wine is fruity and fun and we hope you’ll give it a try. Categories: Uncategorized | Tags: Blackburn Cabernet, cabernet Sauvignon, dogs | Permalink.